Despite a few cobwebs, Capcom's spin on 'Zelda' still feels relevant. What makes a good Switch game? The consensus seems to be something that isn't graphically demanding, has a quick gameplay loop or is easily played in bite-sized portions. Local multiplayer helps out a whole lot, too. Take a look at the eShop and you'll notice a theme: ports. Nintendo has already sold around 20 million Switches and publishers are keen to cash in on the system's popularity. Rather than building entirely new games for the platform, though, publishers and developers are opting to make their existing games work on the comparatively underpowered console. Sometimes the results are miraculous, like the portable versions of Doom and Wolfenstein 2. A lot of the time it's indies like Firewatch and most recently, Dead Cells. Less technically demanding, sure, but important evidence to bolster the system's reputation as having more than just first-party games. And then there are the ports of games from console generations passed. Okami HD is one of those, and because the Switch launched alongside one of the best Zelda games in years, on paper this 12-year-old homage to Ocarina of Time should be a natural fit for the system. In practice, it mostly is. I missed Okami when it was first released in 2006, and then when it got the HD remaster treatment for the Xbox One and PlayStation 4 last year. I'd always heard good things, but somehow never got around to playing it. Now though, it's a different story. I'm prepping for a move across the state and all my games are boxed away and inaccessible for a few weeks. I've got a lot going on, and at the moment I'm after comfort food, not some new, radical experience. Okami HD is the best mashed potatoes I could hope for. It borrows liberally from the formula Nintendo established with A Link to the Past on SNES and then translated into 3D with Ocarina of Time, with a dash of Super Mario Sunshine's "clear away the pollution" mechanic thrown in for good measure. 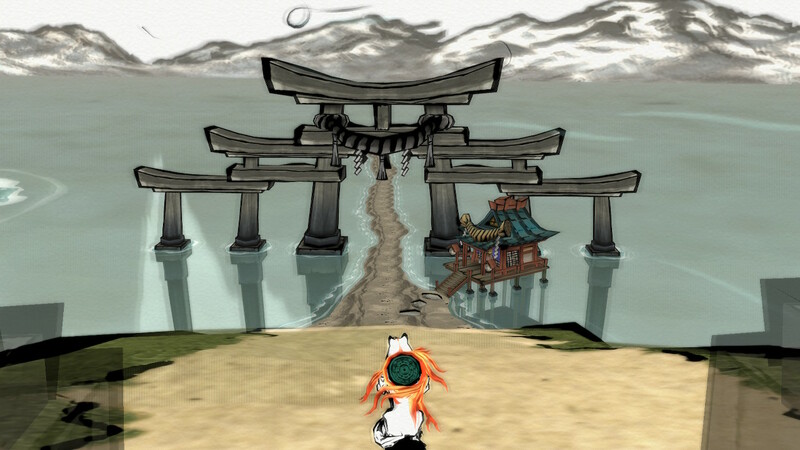 You play as Amaterasu, a white wolf who is actually the god of sun and light reincarnate, capable of manipulating the environment with a mystical paintbrush. Draw a circle in the sky to bring the sun out, a quick line through an enemy to slash at them, a squiggle to cover a foe in ink and halt an imp in its tracks. This, combined with its gorgeous cel-shaded art style help set Okami apart from being just another Zelda rip-off. Okami HD is the best mashed potatoes I could hope for. Thanks to the Switch's touchscreen, you can even "paint" the brush patterns with your finger rather than clumsily draw crooked circles with the Joy-Con's analog stick. But, there's a problem: Drawing on the screen requires you to take your left hand off the Switch, or awkwardly half hold it and stretch your thumb to the middle of the screen. Even with particularly big hands, I found myself worried I was going to drop my console. In the back seat of an SUV on a smooth stretch of highway that's one thing, on a crowded bus or subway car, it's a little more precarious. At home I play in TV mode, but I still find myself pulling my Switch out of the dock when I need precision brush strokes. After my fifth try at following along with the Konohana Shuffle to learn the water lily brush stroke (it makes sense in the game, trust me) with my Pro Controller and plenty of unskippable dialog screens later, I walked across the room, pulled my Switch out of the dock and nailed the test on my first try. I'm not sure I could've done that on public transit. Before switching to the TV, I had started the game in handheld mode, but found myself immediately irritated. I had been mashing every button on the right Joy-Con for 20 minutes to make the protracted exposition dump — excruciatingly delivered typewriter-style, letter by letter — move faster and hadn't gotten to actually play. What was merely annoying during the PS2 era is unbearable in 2018. Once I got past that, the game got out of my way and minor conversations with NPCs don't seem to take any longer than they did in Ocarina. Dropping my Switch into the dock doesn't make the problem with conversations any easier to deal with, but at least it's easier to appreciate the game's vibrant aesthetic and sharp line art on a big TV screen. Despite these niggles, the underlying game is great. Devil May Cry creator Hideki Kamiya and his team at Clover Studio crafted an exceptional adventure a dozen years ago, and that the game holds up so well despite its age is a testament to the talent involved. While the many unskippable dialog scenes and sometimes wonky painting mechanic might not make it the perfect Switch game, they don't stop it from being a great game that just so happens to be on the Switch.